v. : col. ill. ; 28-34 cm. Began with v. 1 (May 1950). Vols. for 19 -19 issued by Panama Canal Co.; <Oct. 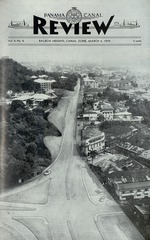 1, 1980-> by Panama Canal Commission. "Official Panama Canal publication"--19 -19 . Description based on: Oct. 1, 1980.
to the hermit a good, clean cave. exposed windows at very low cost. 000 is budgeted for the coming year. increases spread over a long period. restore the house to its pristine condition. are made at a modest cost to the employee. new Rainbow City houses were built. Services Division as Chairman, J. M.
Cooke, Designing Engineer, and L. B.
is to be administered in the future. home of Mr. and Mrs. J. W. Detamore. Here, daughter Kathy takes a look. walk at the home of Mr. and Mrs. W. B. Perry, of 5775-B, Diablo Heights. aiso. Paving of basements has provided extra utility and recreation space. At far left: Hot water heaters are an important part of the livability program. This is one of the many which were installed recently in housing in Paraiso. but also makes a play-place for the Walter Allen children, of Diablo Heights. tensions, and other patio improvements. between March 15 and April 1, 1959.
submit their request by letter. depend upon the availability of funds. has been spent on basement paving. the Chief, Budget and Rates Division." Extending and roofing the patio of the D. A. Yerkes quarters in Diablo Heights cost $524.05, adds about 75S rent weekly. sophomore class and if possible to Grade 9.
world history may also be added to the list. oped natural resources of the nation." ting these pupils all over the country. seniors and 26 were in the junior year. were entered in these groups. cluded in the senior class schedule. about a third that number of students. when to stop," says Hugh "Scotty" Linn. Drydock, that's exactly what he does. ing, noon-day, and afternoon whistles. At 11:55 he blows another "get ready"
whistle of the day is at 4 o'clock. nalling work hours are a full ten seconds. the tube and ring bright and shiny. make up for his former error. whistle to keep him alert. and has won prizes in local contests. with his wife and five children. ing, whistle blower on the Isthmus. way of a canal through the American Isthmus. Howard T. Critchlow, Staff Director of the panel, and W.
are not affected by the new leave order. credit to their new maximum of 460 hours. Most folks ignore it once they've gotten it. It isn't good experience to be injured in an accident. Many things learned by accident, we shouldn't have learned at all. Your best friend will run over you on the highway. When you do have an accident you have ignored experience. liable to get knocked off by accident. You don't need the extra feet of a new car that won't fit a garage. To trade in your old car, you get less than what you still owe. A good credit rating is better than the cash in your pocket. When you accept nothing but the best you end up with nothing. You can't live high on the hog if you don't bring home the bacon. It really doesn't ruin a kid's personality to give him the "old fashion"
disciplinary action for a traffic violation. Many things we used to call sin are now called experience. you've reached the crest of the hill. () Locks Overhaul injuries included in total. Civil Defense Nurses Aid training course. forward to each year with interest. to not more than 25 persons. the Easter vacation on the Pacific side. Defense Corps under E. M. Browder, Jr.
ceived training the past two years. week-day night will begin this month. Group Hospitalization plan, it was announced late last month. medicines, ambulance service, oxygen, and similar services. New Employees Manual being prepared by the Personnel Bureau. Serv. Center 8:oo p. m.
Serv. Center 9:oo a. m.
Published Monthly Al Balboa Heights, C.Z. Panama Canal Information Offier ..
On sale at all Panama Canal Service Centers. he Panpma Canal Review. Balboa Heights C. Z.
an office, armory, and supply room. ing at Balboa Heights a cooler, more comfortable place to work. work will be done one floor at a time. Internal Revenue Office Representative, arrives on the Isthmus. Zone tax payment deadline which falls on April 15. Trygve J.
this year, will join Mr. Gerda early in April. This is how Fourth of July Avenue will look near the J Street intersection. her, along with architect's rendering by Felipe K. Ben, Jr., Architect, show how the completed bridge will look. one of the notable structures of the world. slicing away Farfan Hill for the new west approach. the contract took place February 17 in Governor Potter's office. first preliminary plans and cost estimates. will be the two largest to be awarded for the project. firm designing the bridge and preparing plans. months with the contract to be awarded this calendar year. little first-grader with the big eyes. a smiling face. Miss Baird looked down. "Yes," she said. "Laura, that's it." whole sentence which told about "Puff"
is opening up for her. the Program for Handicapped Children. Laura's fingers fly as she spells out her name in Braille for Miss Lillian Baird. Wayne University in Detroit last spring. if they could see what they are doing. they will some day join. size, "a little farther to the right, Laura. Move your board up a little." cial techniques and special equipment. tail stores, conferred with labor panels. the Department of the Army. man of the Board; Commander R. A.
Gordon Frick, Secretary of the Board. of the Panama Canal's "electric mules." use when relay lockages are required. bility fore and aft by the operators. twice as powerful as the present "mules"
ments is shown by this combination of drawing superimposed on photograph. perimental units purchased from the R.
ing cables away from the lock walls. prevent cable overlays and snarls. without danger of electrical faults. prior to beginning actual manufacture. about 14 months after the award is made. for the east lane of traffic at Gatun Locks. the extra locomotives for relay lockages. one-ton boom horizontal lifting capacity. street intersection at "The Limits." which Mr. Ben had to work. with the seaway. The other is Adm. H.
tember 1946 to April 1947.
out of the frying pan into a deep freeze." ters at all, it's just the stamp. fore they are packed in the machines. before it is folded into the cardboard. when packing large orders of stamps. pouring was to begin in August. the United States began the Canal work. constructive enterprise of modern times." flatly in favor of a lock canal, Col. G. W.
picking up, 25 years ago this month. total of each during the ferry's history. dollars, but no funds were available. of President Franklin D. Roosevelt. ance occurred 25 years ago this month. collection operations in the Republic. proclamation 10 years ago this month. and complete study of proper tolls levels." March 1949. Sponsor of one bill was Rep.
Vito Marcantonio of New York. Rep.
sented the second bill two days later. at DeLesseps Park on the Zone border. third man to hold this post. ing the Isthmian Canal studies of 1947.
ished for the construction of the bridge. year with the building of 41 apartments. ployees of the Canal organization. Rare, Medium, or Well Done ? itself as the fat slowly melts. No other basting is necessary. and there's enough to serve 200 people. each to the agencies in the campaign. pearance for the past nine years. last month are natives of the Canal Zone. All but one have continuous Canal service. vision. Both were born in Ancon. employed as an artisan, February 27, 1934.
service with the Company on February 15.
nated as the Office Engineering Division. His present position is Structural Engineer. Bristolville, Ohio, is Mr. Sager's home town. continuous, is a Texan, born in El Paso. the Canal as a customs guard. Chief of the Panama Canal Printing Plant. W. Va., Staff Nurse at Gorgas Hospital. lard, an early-day Army post. ator Mechanic Foreman, Power Branch. better or equal his record. jobs for two of January's 15-year men. 23 days; future address unknown. years, 2 months, 25 days; Canal Zone. from New York Tuesday spend Saturday in Haiti. to the Canal Zone Library-Museum. struction period. The dish, which Mrs.
is another interesting item she donated. the well-dressed lady of 1910.
was recently donated to the Museum. and several favors from early-day parties. they contributed to the Museum. contribute should get in touch with Mrs.
School Teacher, Division of Schools. to Clerical Assistant, Fire Division. counting Clerk, General Audit Division. man III to General Foreman. Operator II to Heavy Equipment Operator. Operator II to Maintenance Machinist. to Control House Operator, Locks Division. Wireman Foreman I, Locks Division. rigan, William J. Carson, and Charles J. 4 0K. /,,..v. 7. .
service in Cristobal and Balboa. *Includes tolls on all vessels, ocean-going and small. and will remain in port until April 2.
bolted to the wood core to form a girder. boa where it was installed on the Cascadas. by Norton, Lilly & Co., local agents. and from 6 until 9 p. m.
ships is scheduled for early in 1960.
way from Gulf ports to the Far East. new type for the Knutsen group. by C. B. Fenton & Company. means paved patios, tiled bathrooms, improved kitchens, water heaters, window jalousies -at small increased rents tensions, and other patio improvements. its scope. The Livability Program Cominvolved through increased rent; that The Committee is returning to U. S.mittee has now outlined the general feaany improvement made to the quarters citizen occupants all requests for imtures of the program and developed a be of such character that it would be provements on which no action was pospolicy statement under which it will be generally acceptable to a future tenant; sible during this fiscal year due to the administered. Because of the widespread that high consideration be given to limited funds available They, along with interest in the livability program, the such improvements that would extend others who may be interested, are being Committee's statement is quoted in full: the useful life of the quarters; that no requested to re-submit their requests for "The administration of a program of alterations be made to quarters that work to be considered during the coming improving livability of quarters on a are scheduled for demolition within fiscal year. Requests will be received in long-range basis must necessarily follow the next ten years; that rental increase the Housing Offices during the period a reasonable and sound policy. Personwill be at the rate of 60 cents a month between March 15 and April 1, 1959. alities, friendships, ratings, grades, and per $100; that no alteration totaling Those occupants who have received quarseniority wiil not enter into the execumore than $1,000 be made to quarters ters improvements may submit their retion of the program. All alterations to until such time that it is apparent that quests for additional items; however, quarters should be based on sound ecothe requested alterations costing less preference will probably be given to those nomic principles. Many of the quarters than $1,000 will not exhaust the funds who have not benefited under this year's in the Canal Zone can be improved in then available; that improvement to program. some respect or other, and the Company executive and officially assigned quarNew forms will be attached to those gain by an improved structure, and yet ters be given out-of-line consideration being returned for revision and re-subthe tenant be perfectly happy about payfor improvement under the program; mission. Other occupants interested may ing a higher rent for the benefits derived that an effort be made to minimize obtain the form at the Housing Office or from the improvement; other quarters the cost of improvements to the renter submit their request by letter. have reached such a state of obsolescence by grouping the maximum number of Only those requests received during and deterioration that the recovery of units possible of a given type of imthe period of March 15 to April 1 will the cost of improvements made now provement into a single contract packbe considered in the preliminary planwould be doubtful or impossible. In any age; that the timing of execution of the ning. Action on subsequent requests will event, the order in which alterations are work, consistent with the obligation of depend upon the availability of funds. made must be based on a series of rules available funds within a given fiscal In the Latin American communities, which are predicated on a sound Comyear, be delegated to the Engineering $20,000 has been earmarked for jalouspany policy. and Construction Director, in order ies; $39,800 for water heaters; and $3,600 Policy that execution of this policy be delehas been spent on basement paving. "To fulfill the desires of the tenant gated to a committee consisting of the While the livability program has been within the limits of funds made availChief, Community Services Division, widely publicized, there are many emable for this purpose, so long as he is Chairman; Designing Engineer, and ployees who are not fully informed on willing to pay for the improvement the Chief, Budget and Rates Division." Extending and roofing the patio of the D. A. Yerkes quarters in Diablo Heights cost $524.05, adds about 750 rent weekly. LA BOCA Rare, Medium, or Well Done ? New Town Rising on Old Site The revival of La Boca as a Canal Zone community is starting this year with the installation of a new street and municipal facilities, and construction of five masonry houses. The site of the new construction is on La Boca Road just cast of the former Commissary. The work is being done by the Engineering Corporation, Inc., of Panama. The firm was awarded the contract at a cost of $211,838 early in January, with a time limit of 180 days for completion. The work done up to now consists mainly in ground preparation and street work. The group of houses will be accessible only from La Boca Road over the new street being built to replace Martinique Street which ran in front of the Commissary. The new community is scheduled for completion during the fiscal year 1961 "Take the whole leg of a steer," begins the recipe that Joseph when it will have 33 one-family and 30 S. Wallace passes on to housewives who would like to cook a duplex houses. The proposed streetroast like the one that adorns the Sunday night buffet at the Tivplan provides for one main circular oli Guest House. street connected at each end with BalThis mountain of tender succulent roast beef is called a 'Steamboa Road and a principal street which ship Roast." Just where it gets its name no one seems to know, will cut diagonally across the center of but Steamship Roosts and Sunday night buffets at the Tivoli are the community. The houses will be synonymous to many Zonians. located on these and several short, For those who would like to know just how the roast is cooked dead-end streets. to get such appetizing results, Mr. Wallace, who is Catering The homes being erected in La Boca Manager at the Tivoli, gives this recipe: this year are replacements for family Place a leg of choice U. S. beef, weighing between 80 and units in Balboa which are to be demol100 pounds, in a shallow pan and cook for six hours in oven set ished for the construction of the bridge. at 225 degrees. Turn the meat and cook six more hours. Since The principal quarters construction in an approximately one-inch layer of fat surrounds the beef, it bastethe revived town will come during the itself as the fat slowly melts. No other basting is necessary. next two years. A total of $1,440,000 That's all there is to it. Carve it and you have roast beef to has been budgeted for new construction please all guests whether they like it rare, medium, or well done and townsite development in La Boca and there's enough to serve 200 people. during the coming fiscal year when 45 family apartments are to be built. The community is to be finished the following Coco Solo and France Field. In addition the one now located on Mindi Street. It year with the building of 41 apartments. to the La Boca houses, quarters will be is scheduled for completion within about The quarters construction program at built in Ancon and Balboa under the six months. La Boca is a major part of the overall building program provided in the Master Master Plan. The new gasoline station wil provide Plan for housing on the Pacific side durWhile not a part of the La Boca a modernized service for motorists similar ing the next few years. The Master townsite development, the new gasoto the larger service stations in the United Housing Plan, described in last August's line service station is to be built on States. This will include a small sales issue of THE CANAL REVIEW, calls for La Boca Road only a short distance store for batteries and other accessories, the elimination of all substandard housfrom the new houses. A contract for and provision for car washing, tire changing for the permanent U. S. citizen emthis work has been awarded to Dillon ing, and battery rental. ployees of the Canal organization. Construction Company, low bidder for New construction is planned only on the job with an offer of $60,000. Bids the Pacific side since the requirements for for this work were opened the middle Joint Service Crusade quarters on the Atlantic side have been of last month. Now Under Way In Zone met by the recent transfer of quarters at The new service station will replace Sealed envelopes containing contributions to the Federal Service Joint Some of the new houses to be built in La Boca will follow this design. Crusade are beginning to flow into local banks. The banks will open the envelopes and credit the contents of each to the agencies in the campaign. These are: CARE, Crusade for Freedom and the American Korean Foundation, gifts for which are made in one envelope, and the Canal Zone Chapter of the National Tuberculosis Foundation, which has its own envelope. The campaign opened February 23 and will close April 4. Approximately --500 keymen in the Canal organization distributed materials on the campaign and envelopes for the contributions throughout Canal units within the past 10 days. No quotas have been set and no payroll deductions are being made. MEMORIES ---revived by souvenirs of construction days Memories of Construction Days gala Wright was employed as a rodman with Tivoli dances, and Canal Zone auctions -the Panama Railroad. Later he served are brought to mind by the souvenirs of as Municipal Engineer. by-gone days which Mrs. Daniel Wright, Articles which Mrs. Wright has sent of St. Petersburg, Fla., has contributed to the Museum are souvenirs she collected to the Canal Zone Library-Museum. between 1904 and May 31, 1921 when Oldtimers and students of the early they left the Isthmus. history of the Canal will be particularly Other items include a silver candlelainterested in a silver bon-bon dish which brum, also bought at a Balboa auction, is believed to have belonged to the Deand several favors from early-day parties. Lesseps household during the French conOne of the more interesting of the souvestruction period. The dish, which Mrs. nirs is a Panama Railroad spike fashioned Wright bought at a Balboa auction many into a letter opener. years ago, soon will be placed on display Mrs. Wright became interested in the at the Canal Zone Museum in the Civil Museum when she and Colonel Wright Affairs Building along with other items -returned to the Zone for the observance contributed by old timers. of the Roosevelt Centennial. Several other oldtimers who came down at this A formal gown which Mrs. Wright time brought along programs, favors, wore to a Tivoli Ball in the early 1900's and various small mementos which is another interesting item she donated. ane vriut ta the whsch The res of lowred rep de hin .they contributed to the Museum. The dress of flowered crepe de Chine Such items are needed for the Conclosely resembles the empire styles of Edelin Price, whose great-great-grandstruction Days display and anyone who today and though tattered and faded father came to the Isthmus in 1860, has mementos which he would like to gives a good idea of what was worn by is holding a silver dish dating from contribute should get in touch with Mrs. the well-dressed lady of 1910. the French construction period which Eleanor Burnham, Curator of the MuColonel and Mrs. Wright came to the was recently donated to the Museum. seum, who will provide packing and shipCanal Zone June 6, 1904 when Colonel ping information. PROMOTIONS AND TRANSFERS January 15 through February 15 Employees who were promoted or transHeavv Labor Foreman to Lead Public gineer, Railroad Division, to Loc k operaferred between January 15 and February Works Foreman. tor 11, Lo cks Division. 15 are listed below. Within-grade pronoRay Caldwell, from General Foreian III John J. Sproul, froun Guard to (Gtiard tions are not reported. to Chief Foreman. 'LIuervisor, I ocks D vision, CANAL ZONE CENTRAL EMPLOYMENT Karl W. Shirley, froint Marine Inspection iCE ESherman A. Hammond, from Lead ForeAssistant to Admse roer, Navign t iman IllI to General l'oreman. vision. Mrs. Verna A. Barnett, Clerk StenograEstle H. Davison, from Pnmpig Plant Allen R. Flinn, front Wirenian i Foreian pher, from Navigation Division to Canal Ope II to eisvy Equipment Operator, to Control House Operator, Locks Division. Zone Central employment Office. Operator Arnold W. Jackson, froit Wireinin to Paree L. Roland, from Lead Foreman II Wirema ii Foremilaii I, Locks Division. CIVIL AFFAIRS BUREAU to General Foreman. Joseph M. Vandergrift, from Control Mrs. Helen S. Witkin, from Substituten Hoise Operator to Locknster, Locks DiTeacher to Elementary and Secondary DeLeon Tschumy, fromntac alhmiiig Puit vision. School Teacher, Division of Schools. Operator 11 to Aaintenance Machiiiist. Mrs. Bernadine C. Lally, from StelnogWalter H. Alves, Jr., from Police Serrapher, Executive Planning Staff, to Clerk geant to Motorcycle Sergeant, Police DiHarry E. Pearl, from Civil Engineer to Stenographer, Navigation Division. vision. Construction Management Engineer, ConJames A. Fraser, from Apprentice Cabletract and Inspection Division. splicer, Electrical Division, to Towig LoFredeiick A. Mohl, from Fire Sergeant .omnotive Operator, Locks Division. to Clerical Assistant, Fire Division. Victor C. Melant, from Supervisory CleriJoseph P. Hawthorne, front Operator II cal Assista nt to A-llin istrative Assistant, to Towing Locoiotive Operator Locks DiOFFICE OF THE COMPTROLLER Dredging Division. visioil. Mrs. Nancy L. Jorstad, from Clerk StenHEALTH BUREAU Herman Wakem, fro: Guard to' Towing ographer to Travel Expense Claims ExaniHarry A. Dunn, from Medical Technician Locoiotive Operator, Locks Division. iner, General Audit Division. to SUpervisory Medical Technologist, Board PERSONNEL BUREAU Mrs. Shirley A. Musselman, from Travel of Health Lalboratory. Ronald Seeley, froi Positio Classifer Expense Claims Examiner to General AcMrs. Martha R. McLelland, from Staff Wage and Clissification Division, to Percounting Clerk, General Audit Division. Nurse (Pediatrics), Gorgas Hospital to sniiel Assistant, Offce of the Chief, EliENGINEERING AND CONSTRUCTION Staff Nurse (Medicine and SUrgery), Coco ploynient and Utilization Division. BUREAU Solo Hospital. OTHER PROMOTIONS Maintenance Division MARINE BUREAU Promotions which did not involve change Max M. Schoch, Peter A. Warner, MurRobert G. Peterson, from Safety lispeci. title follow: rel L. Dodd, and Vernon C. Douglas, fro tor to Supervisory Administrative Assistant, John F. Shannon and Waldo B. Gilley, Lead Road Construction Foreniaii to Lead Navigation Division L,ad Public Works Foremeini, \Maintenance Public Works Foreman. Robert K. Adams, from Towing LocomoDivision. Other T. Brownlee, from Lead Helavy tive Operator, Pacific Lucks, to General George A. Wills, General Foreman, Labor Foreman to Lead Public Works Dockiig and Undockimg Fioreiaiii, NavigaM ainitei nnce Shops, Maill tenan nce Division. Foreman. tioi Division. Mrs. Ruth B. T. Elders, Physical TheraMurphy B. Alexander, froni Lead Road Mrs. Mary L. Peterson, from Staff Nurse, pist, Health Bureaui. Maintenance Foreman to Lead Public Works Coco SIn Hospital, to Head Nurse, IndnsWalter E. Marek, John A. Snodgrass, Foreman. trial Division. James F. Ahearn, Samuel J. Garriel, KenCarl L. Simons, from Lead Paving and L. Leroy Barfield, from Locomotive En neth E. Marcy, William W. Spencer, Ralph L. Sell, Nslson 0. Wili.r, PeteT. Corrigan, William J. Carson, and Charles J. Roth-Roffy, Jr., Lead Foremien, Quarters March 6,1959 THE PANAMA CANAL REVIEW 15 Xaintenance, MI\aintenance Division.